It never ceases to amaze me when September rolls around, how the level of energy and activity increases. Fall is indeed a time of change. In my yoga classes, I see students arrive on their mats with varying degrees of attentiveness and ease, from the students who can’t seem to stop fidgeting to the ones who look utterly exhausted and would be more than happy to stay in Savasana the entire class. Outside the yoga studio, the hustle and bustle is easily apparent as people focus on their tasks after a slower August, whether it is preparing for the school semester or dealing with increased demands on the job. If you live away from a city, particularly in a place with distinct seasons, you also witness more activity among our animal friends, from the flocks of birds that dot the sky to the woodland creatures scurrying around in search of food. Much like springtime, there is a level of heightened activity in the fall as we prepare for our upcoming winter hibernation. If you’ve been feeling scattered or rushed as a result, you’re not alone. It’s in the air! So this is a perfect time to find some inner balance on your mat to better handle your own seasonal curveballs. Here are some of my favorite poses for fall, easy to do morning, noon, or night. I selected these three because they help move the spine in multiple directions (yay for mobility!) as well as cultivate strength. 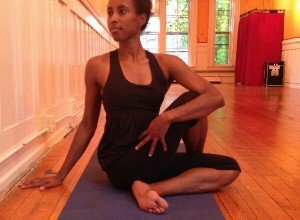 These poses also offer both calming and stimulating elements to help nurture your inner balance this season. Backbends are notorious for infusing the heart with a rush of freshly oxygenated blood. They open your body up to take bigger breaths, and the resulting oxygen can be like a shot of caffeine for any lethargic body. The stimulation to the respiratory and circulatory system doesn’t hurt in warding off any of those seasonal cold bugs either. Twists build heat and contribute to our digestive fire, which helps cleanse us from the inside out. Similar to the effects from backbends, twists are revitalizing as well as balancing for the spine. The benefit of this seated variation encourages you to ground down through the sit bones and more easily rotate from the belly button up, the perfect position to contemplate life’s deeper questions in a just a few breaths. This forward bend reduces external sensory distractions and can help quiet the mind. It offers a gentle and passive stretch for your back and shoulders that automatically invites you to sigh with gratitude. Listen to your breath here, and may the practice help you be that much more discerning about where you choose to dedicate your energy off the mat. 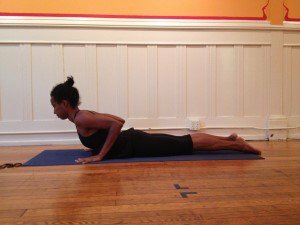 Take your time with these poses, to layer in a more soothing tone to your practice. Stay in the first two poses for several breaths, 3-5 to start. Embrace an exploratory attitude rather than attempting to hold the poses rigidly; if you’d like to add a little pulsation or mini-Vinyasas within each, please do. And the last pose is yours to enjoy as long as you like.